'Barsha-Baran' was held on April 13, 2019 at Pleasantview Community Hall (10860 57 Ave NW, Edmonton, AB T6H 1C2). With the presence of so many people, the event was a huge success. From decoration to food to cultural programs - everything was just awesome. 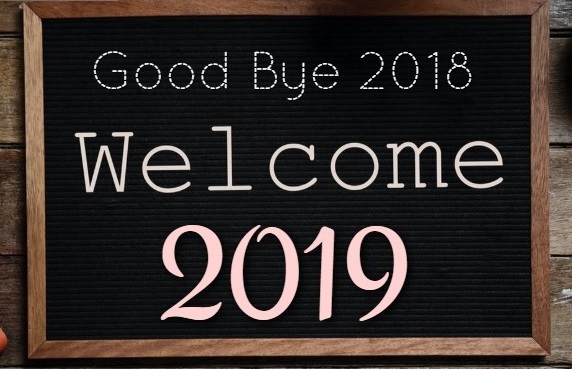 2019 Annual General Meeting (AGM) was held on March 30, 2019 from 12 to 3 PM at the India Centre (Council of Indian Societies of Edmonton) located at 9504 -37 Ave NW, Edmonton, AB, T6E 5K3. 'Saraswati-Puja' was held on February 09, 2019 at Pleasantview Community Hall (10860 - 57 Avenue; Edmonton). At noon, we will have Puja, 'Anjali', Prasad and Lunch. In the evening, we will have 'Aarati', Dhunuchi-Dance, Dinner & Cultural Programs. 2007 Sa-Re-Ga-Ma-Pa contestant Sumana Ganguly will be our guest artist for the evening along with with few local talents. 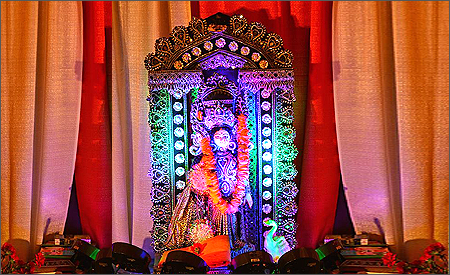 'Durga-Puja' was held from October 12-14, 2018 at South Edmonton Sejong Multicultural Centre - 2503 Ellwood Dr SW, Edmonton, AB T6X 0P7. 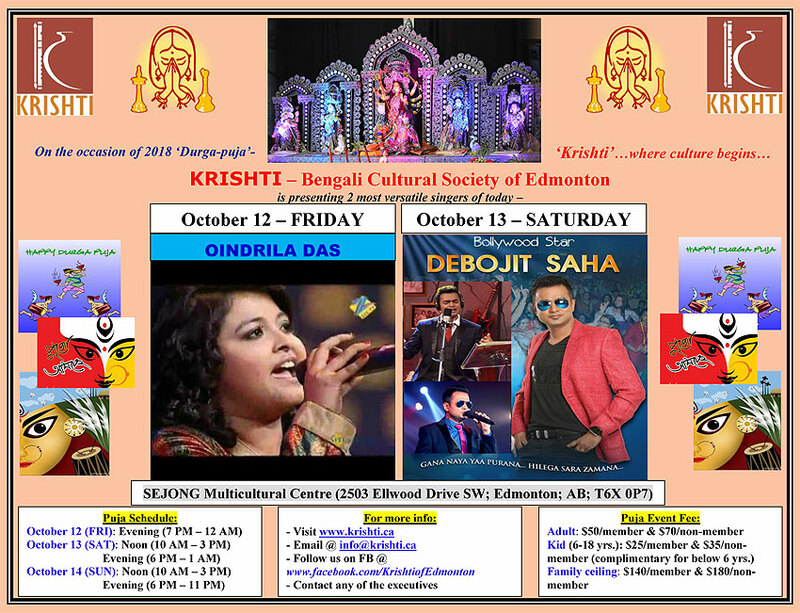 Our biggest event 'Durga-Puja' was held from October 12 to 14 (Friday evening to Sunday night) at Sejong Multicultural Centre (2503 Ellwood Drive SW; Edmonton; AB; T6X 0P7). Oindrila Das a prominent singer and Debojit Saha, 2005 'Sa Re Ga Ma Pa' champion and a famous playback singer are coming to hypnotize us with their super melody on October 12th (Friday) and October 13th (Saturday) respectively. More details are coming soon. "Hoodies...Bonfires...Cuddling...Fall is almost here". 'Krishti' is getting prepared to welcome 'Fall' with its unique style by organizing the event 'Agomoni'...in another word 'Mahalaya'...which right way takes us to that very mesmerizing world of music..."Baajlo tomaar aalor benu". On September 29th (Saturday), 'Krishti' will have this 'Agomoni' event at Blue Quill Community Hall (11304 25 Ave NW; Edmonton; AB; T6J 5B1). The event will start at 5 PM and will continue till midnight. There will be many stalls of clothing, food etc. 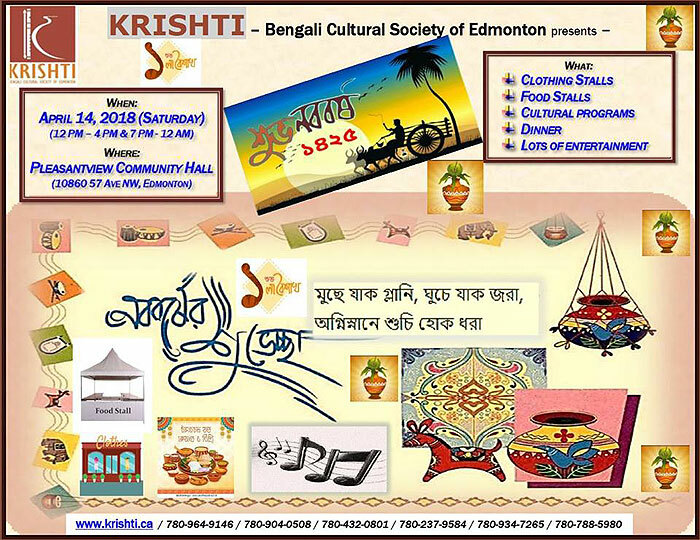 If you are interested to put a stall, please contact our Vice-President Moushumi Indu @ 780-904-0508 or our Cultural Secretary Runu Chowdhury @ 780-934-7265. AGM was held on March 31, 2018 from 12 to 2 PM at India Centre (Council of India Societies of Edmonton) - 9504 - 37 Ave NW; Edmonton. The Bauls are a group of mystic minstrels from Bengal, which includes the country of Bangladesh and Indian State of West Bengal. Bauls constitutes both a syncretic religious sects, but their membership mainly consists of Vaishnava Hindus and Sufi Muslims. They can often be identified by their distinctive clothes and musical instruments. 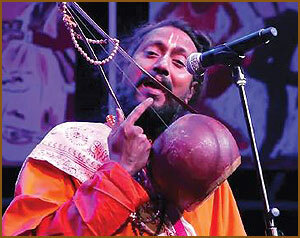 Lalon Fakir is regarded as the most important poet-practitioner of Baul Tradition. Baul music has a great influence on Rabindranath Tagore’s poetry and on his music Rabindrasangeet. Lakhan Das is number one and most popular Baul of West Bengal right now. His roots are in Bolpur, Birbhum. He has travelled many countries in the world and sang in many Bengali Musical Conferences across the world. Krishti is proud to host Lakhandas Baul during Durga Puja 2017.